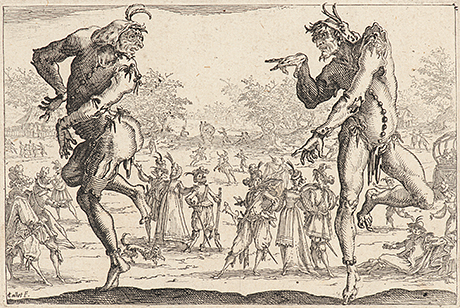 Jacques Callot (French, 1592–1635). The Two Pantaloons (Les Deux Pantalons), 1616. Etching. Second of two states. DAC accession number 1971.18.1. Friends of the Davison Art Center, Theater Department, and purchase funds, 1971. Open Access Image from the Davison Art Center, Wesleyan University (photo: M. Johnston). From eye rolls to crude hand gestures to statement jewelry—we exaggerate with our bodies as much, if not more so, than with our words. Yet, more than 500 years after the Renaissance, conceptions of the “normal” body remain grounded in ideals of the human body as mathematically proportional and bare. This exhibition presents bodies exaggerated in their accouterments, pose, and anatomical proportion from the sixteenth through the nineteenth centuries. Across artistic movements and historical contexts, artists exaggerated bodies to evoke from spectators responses as varied as sympathy and shock, offense and desire. The opening reception is co-sponsored by the Wesleyan University Center for the Humanities in connection with the spring theme Hyperbole: Sense, Sensation, Spectacle.